Been making these pops for a few years now! I really love them! today im using strawberry instead of raspberry( didn’t the raspberry today) and I added and extra treat by putting fresh halved cherries in the strawberry layer! depending on the ripeness of fruit you can leave out the sugar! use any fruit you want! they are liked buy everyone ive given them too! Sure give it a try! Let me know how they come out! 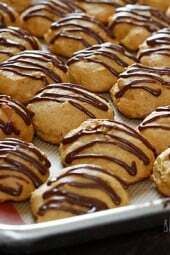 Just made these today and what a hit they were with my family! Delicious and easy. 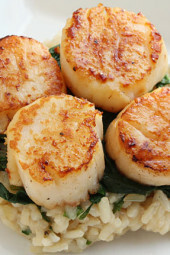 I am posting on my Facebook page- "Betsy Cooking with Pampered Chef" and linking here. Thanks, again, for a wonderful recipe! What size cups did you use? can i use all frozen fruit and if so, do i thaw them out completely first? Do you need to make a simple syrup? or is that just for taste? If the fruit is sweet enough, can I just blend the fruit and freeze the mold? Or is the simple syrup needed to hold everything together? It's just for sweetness, I found the fruit too tart without it. Thank you for this idea. My 8 month old was enjoying this as much as I was. Hi, wanted to know where I can find those bowls? I love asymmetrical bowls and would love to add these to my kitchen! I would love to try these, but my son is allergic to mangos. is there any fruit you suggest to substitute for the mango? Does anyone have an idea of what to use instead of mangos? Peaches would give you the same color. 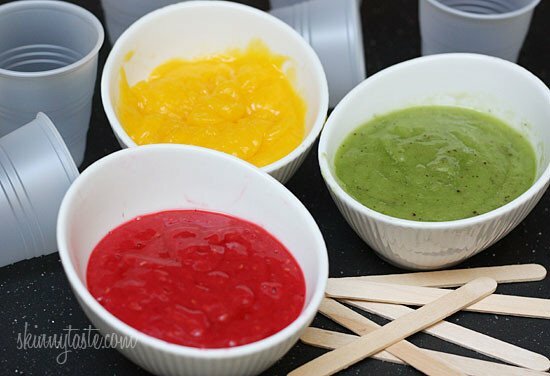 Everyone else is looking for Autumn-warm-you-up recipes, but I live in Hawaii and I'm still LOVING the frozen goodness recipes! THANK YOU!! How would the fresh fruit compare to using frozen? Just in case I can't find fresh mangos but still want to make it with mangos. My kids are going to love these! Made these today & they are amazing! I used agave instead of sugar. They are so delicious! Love your blog! These are SO delish! I'm back on the WW bandwagon again and I have zero guilt having these as a little treat after dinner. My 2 year old daughter loves them too! I've made several of you recipes and there honestly wasn't one thing that didn't taste amazing! Thank you!! Gina, THANK YOU, so, so much for having the new AND old Weight Watchers points on each of your recipes! No one else seems to do it! If all the delicious food didn't keep me coming here (which it DOES! ), that totally would! Thank you! Thank you! How long do you think these will last in the freezer?? I have hundreds of mangos and trying to find ways to use them before they go bad! At least a few months! You could do it with all mango if you wish to use them up. You could run it through a sieve and use a spoon to scrape it. Is there any way to reduce / remove the seeds from the raspberries? If you don't add sugar, do you still need to use water or would you just use the fruit puree? Only if it seems too thick. 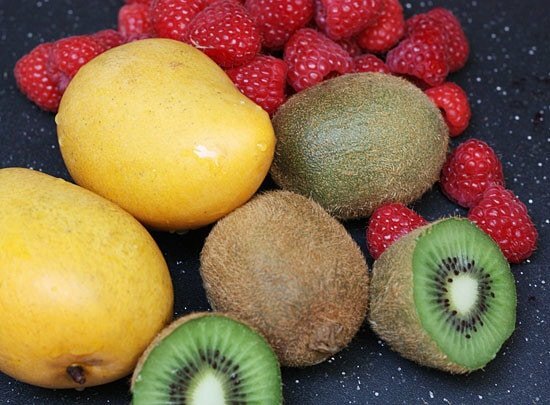 Would you recommend straining the raspberries and kiwis for the seeds? I would use a sieve. Genius idea with the cups! Now I don't have to go out and buy a popsicle mold. Looks sooo good! 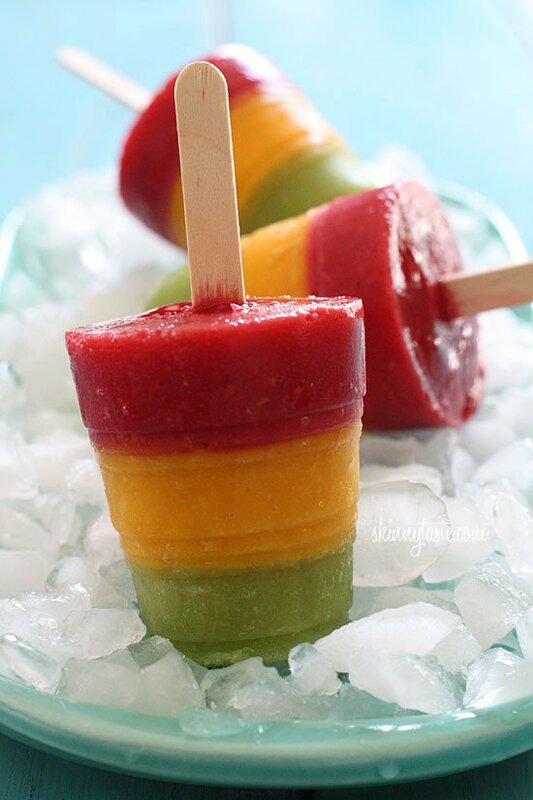 Just a question – if I used different fruit, would I still freeze each layer for the same amount of time? I have strawberries and thought I could use them, but wasn't sure if the time in the freezer was for the specific fruit or just the layer. Thanks Gina! Yes, same amount. It's just to get that rainbow effect and to get the stick to stay in. Awesome, thank you! Also, just tried the overnight oats this morning – delicious! Thank you for getting me out of my breakfast rut! Wow these look delicious! But if fruit are 0 pts why are these 2 pts? Should they be 0 pts if I don't use the sugar? If you put this into recipe builder, it's not 0 because fruit has calories. I am not sure if WW would consider it 0, ask at your next meeting. It must be because of the addition of the sugar, although honestly I can't see how it could possibly be 2 pts. The WW website is so kookie. It doesn't make sense to me half the time. I would guess less than half a point per because of how little sugar. I am going to make these with nectarines in place of mango. Nectarines are crazy sweet right now. Thanks so much for the awesome recipes. Fruit does not count ever…even in recipie builder the fruit will count as 0 points. However, fruit does have calories so WW suggests that you do not consume over 5 "free" or 0 point+ items or fruit per day. But everyone is different so listen to your body and go with that. Any suggestions for a substitute fruit for the mango? Sure what about pineapple? Cantelope? 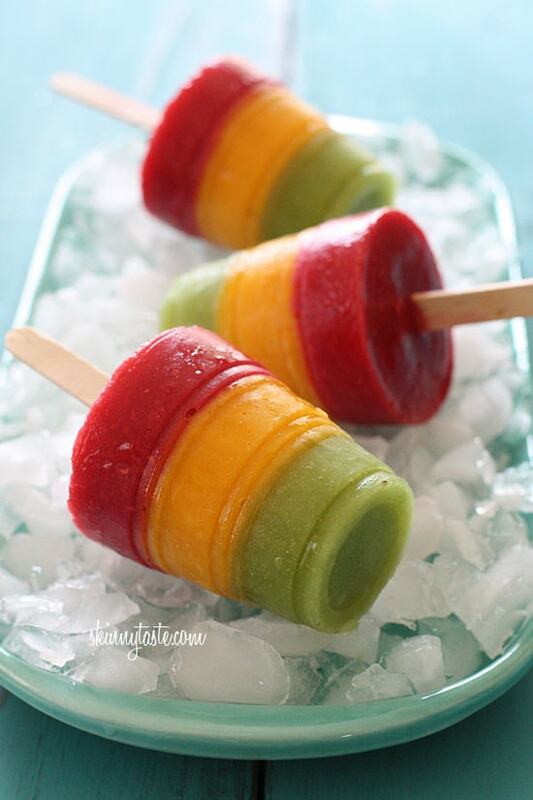 I tried these using peaches instead of mango. They were great! Thanks I only added a little to take out the tartness of the fruit. These look delicious!! I have a popsicle mold my son 'gave' me for mother's day when he was 2 – it would be perfect for these! If I use stevia would I use the same amount as you did sugar? I think you could add the stevia to taste. If your fruit is very sweet, you may not need it at all but if the fruit isn't sweet, add it until you like the flavor. After trying a recipe that LOOKED good on pinterest but was a complete flop in real life,, I gained a whole new appreciation for your recipes. I've tried several and they've all been a huge hit. 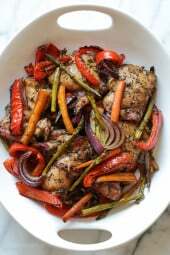 Thanks for all you do in creating and sharing your recipes! Thank you! I test test test before I post! I would hate that myself. 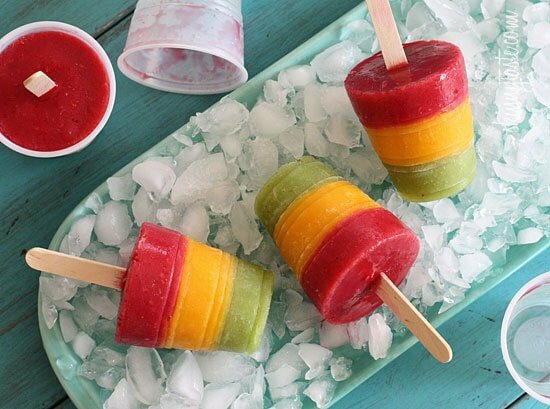 These are your creative Popsicles.You are amazing.Are there more recipes of yours???? ?